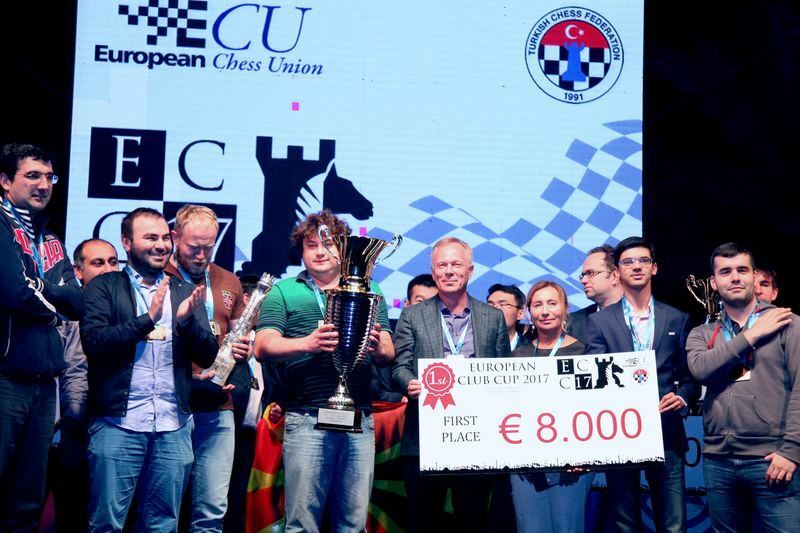 Vladimir Kramnik, Shakhriyar Mamedyarov, Anish Giri and Ian Nepomniachtchi all won as Globus finished with a flourish to claim the 2017 European Club Cup. That win wouldn’t have helped if Odlar Yurdu had won their match, but the Azeri team finally fell at the finish to AVE Novy Bor after Sasikiran beat Nijat Abasov. They still took bronze medals, with last year’s winner Alkaloid taking silver. The women’s event unexpectedly became a thriller but top seeds Batumi ultimately scraped the draw they needed to win the title. The Russian team Globus started the 33rd European Club Cup as the big favourites with a stunning 2772 average rating for their top six players, but they didn’t have it easy. 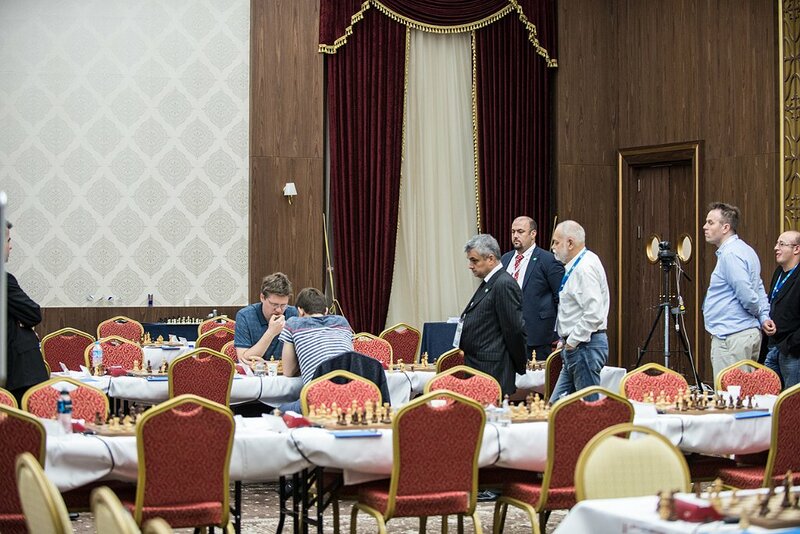 They only drew their Round 5 match against Odlar Yurdu by a miracle and then went into the last round a point behind their Azeri rivals, knowing they needed to win and hope for the best elsewhere. Their opponents, Legacy Square Capital, had only lost a single match, and by a single point, so were expected to put up stiff opposition. In the end, though, they were swept aside by a Globus team finally firing on all cylinders! Vladimir Kramnik set the tone on board 1, since he had the white pieces and got to have some fun. Against Ernesto Inarkiev he played one of the offbeat systems he’s used in his later career to try and get a game with the white pieces, and it worked to perfection. He met 1.c4 e5 with 2.d3, playing a reversed Sicilian and getting his opponent thinking immediately. After 2…Nf6 3.Nf3 Bb4+ 4.Nbd2 Qe7 5.a3 Bd6!? 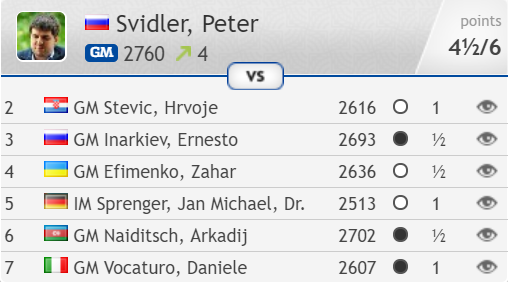 we could again witness the depth of chess, since two top class players had managed to reach a completely unique position by move 5! There were some nervous moments as thinking so early in the game left both players down to the increment as the time control approached and the game sharpened, but Kramnik ultimately kept control and went on to win a rook and pawn ending. 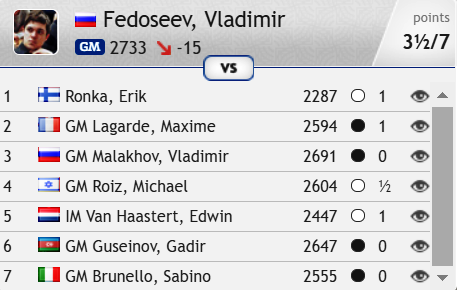 Even the near impossible feat of playing and winning every game in the European Team Championship for Russia later this month would be unlikely to gain Kramnik enough rating points for Candidates qualification, and it seems likely Kramnik will skip that event in any case, meaning we can already congratulate Fabiano Caruana and Wesley So on joining Sergey Karjakin, Levon Aronian and Ding Liren in the 2018 Candidates Tournament. Kramnik said he’ll probably take a long break now before Wijk aan Zee in January, though he did mention he might play in December. That could mean a rare appearance in the Russian Championship, which this year has returned from the provinces and takes place in St. Petersburg. He also credited a Windows update for giving him no time to check his analysis of a line he'd played against Vishy Anand in the Sinquefield Cup! 42…Re4+! was a beautiful exchange sacrifice that couldn’t be rejected and may well have been winning by force. In any case, Evgeniy Najer was unable to find a way to combat the black pawns after 43.Bxe4 fxe4 and the game soon ended in a black win. Alexander Grischuk almost beat Vladimir Malakhov but allowed a perpetual check at the end of the day’s longest game in either section. It was fitting that it ended on exactly move 100! Karjakin carelessly played 48…a6? without thinking, but after Boris Grachev replied 49.a5! he sank into a 16-minute think in what was already a completely lost position. Black has no defence against Bf3-g4-c8-a6 and pushing the passed a-pawn, so Karjakin was forced to resign three moves later and Globus “only” won their final match 4.5:1.5. Anton Korobov was the man who took on the burden of accepting the trophy! 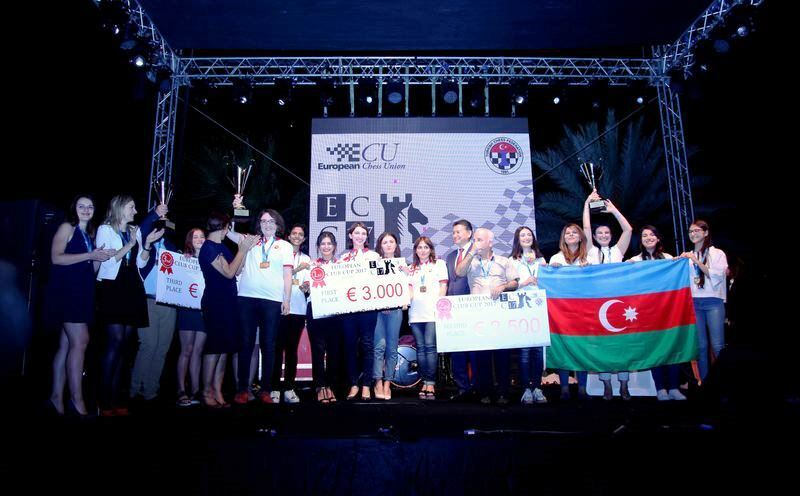 Azerbaijan have had a wonderful warm-up for the European Team Championship later this month with both their men’s and women’s Odlar Yurdu teams finishing with medals and in fact coming close to gold. In the open section they entered the final round facing the tough task of beating 4th seeds AVE Novy Bor. It wasn’t impossible, with Eltaj Safarli pressing against Markus Ragger, who had already lost two games in Antalya, while Gadir Guseinov did well to survive a tricky position low on time against David Navara. 42…Rf2+? wasted a tempo driving the white king where it wanted to go, and after 43.Kg5 f6+ 44.Kg6 f5 45.Rh4 f4 46.Kf5!, the move Sasikiran thought his opponent might have missed, White went on to win the game without any trouble. Instead after 42…c5! it seems Black would have been just in time to save the game. The consolation for 22-year-old Nijat, who until then had had a great tournament, was that the game made little difference to the fight for first place – Globus would have won on tiebreaks if the match was drawn, while Odlar Yurdu nevertheless finished in the medals after tying with their opponents for 3rd place. It was unlucky for Novy Bor, who would have taken bronze if either a board points or a direct encounter tiebreak had been used instead of Sonneborn-Berger, but for their results overall Arkadij Naiditsch’s team had certainly earned their medals. 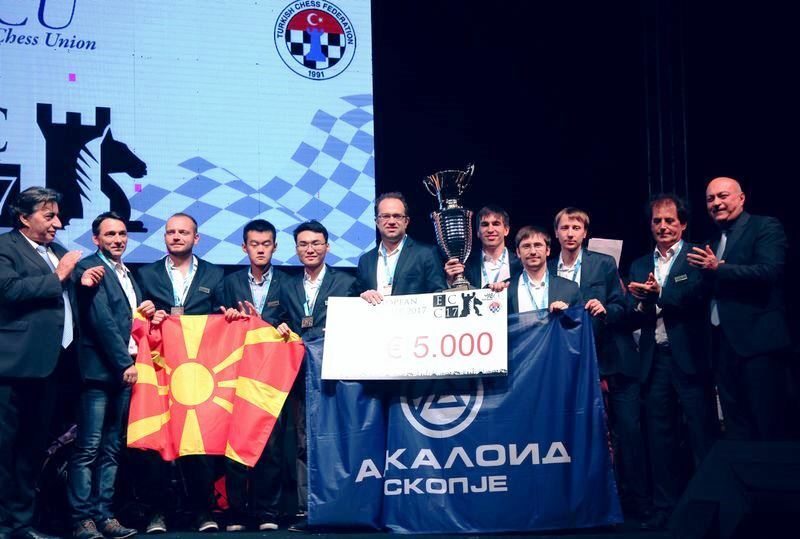 Silver went to last year’s winners Alkaloid, who finished with a 4:2 win over Csm Baia Mare after being unable to make up the ground lost in their Round 2 loss to Legacy Square Capital. 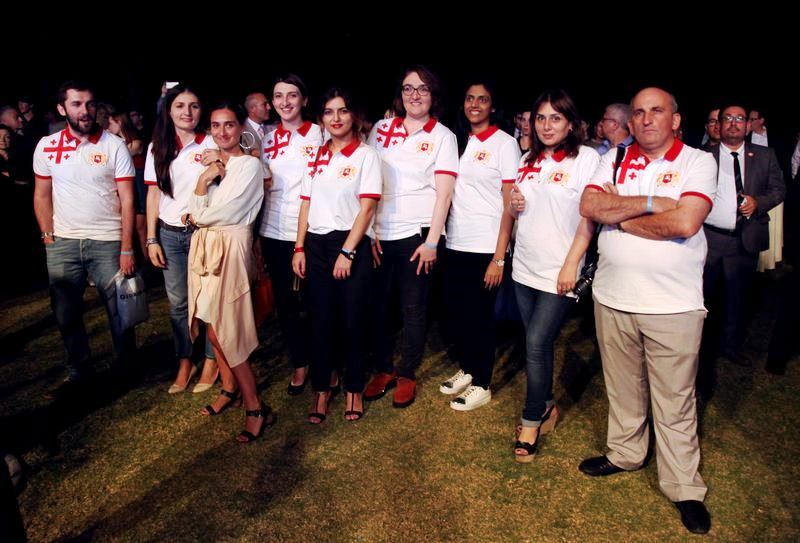 The women’s section seemed to be all but over after the penultimate round, with Batumi Chess Club NONA needing only a draw against a weaker team to take gold while Odlar Yurdu looked guaranteed silver medals. In the end, though, there was more excitement than in the open section! Odlar Yurdu duly won their match, though the 2.5:1.5 scoreline was much more modest than might have been expected against local team Marmara. That might have been enough for gold, though, since Batumi suddenly found themselves in deep trouble. 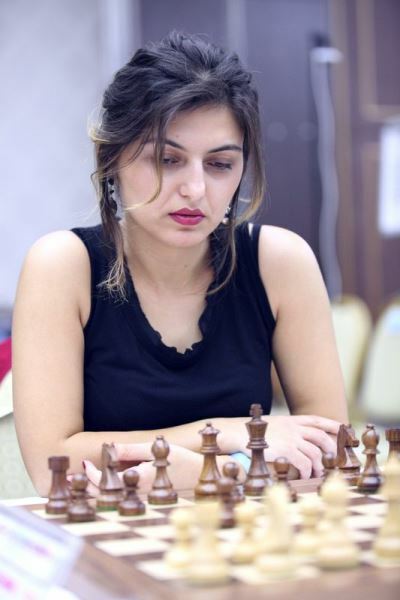 Nino Batsiashvili had scored a brilliant 4.5/5 for her team, but that was somewhat tarnished by two consecutive wins featuring her missing a mate-in-3. On both occasions it wasn’t an irrelevant miss in a position where she simply chose an easier win, but could easily have cost her team half a point. That lost instantly to the simple tactic 36…Rxa7! 37.Rxa7 Qb8+! hitting the a7-rook with check. Nino tried to limit the damage to an exchange, but 38.Ne5 was met by the precise 38…Nxe5! 39.Ra3 Nf3+! and Nino resigned with mate next move. 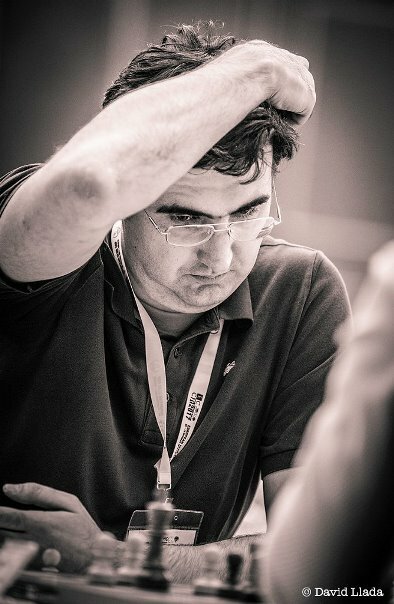 On the bottom board Bela Khotenashvili levelled the scores by beating Angela Dragomirescu while Dzagnidze-Paehtz was a tense draw on the top board. Fortunately the position was still very complicated, though, and here Harika was able to eliminate White’s h7-pawn by giving up the exchange with 51…Rxh7+ 52.Nxh7 Qxh7+ 53.Bh3 and apply some pressure of her own with 53…Qh5. White was still better, but one slip was all it took for Mihaela to be in danger of being worse and offer a draw. 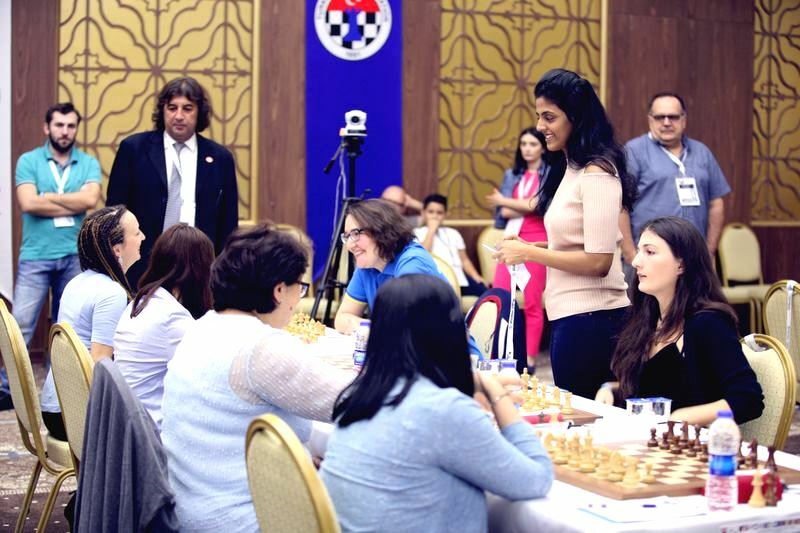 Harika of course accepted and had won the tournament for her team with a sixth draw in Antalya! Odlar Yurdu therefore had to be content with silver, while bronze went to Natalia Zhukova’s Bossa Nova, who had a flying start and a mid-tournament slump before finally ending with two wins. 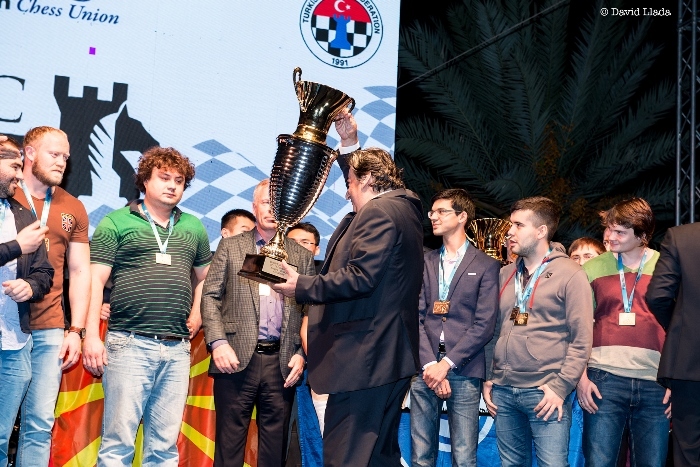 Russia's UGRA Chess Club were the unlucky team to miss out on medals on tiebreaks. So that’s all for the 2017 European Club Cup. We’d like to thank the organisers for transmitting all the games live with almost no issues, broadcasting an excellent live show each day, hiring a great photographer and having one of the best Twitter accounts of any top tournament. Let's end with the traditional "chess after chess" photo! 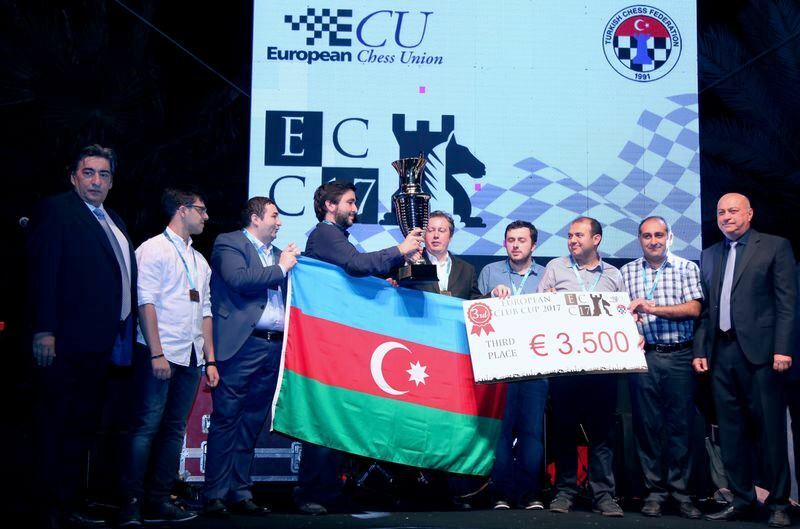 Euro Club Cup 1: Who needs Kramnik?